Laboratory studies were conducted in order to evaluate the toxicity of ethanolic leaf extracts of Euphorbia balsamifera Aiton, Lawsonia inermis L., Mitracarpus hirtus (L.) DC and Senna obtusifolia L. against sitophilus zeamais Motsch. Ten 7 day old S. zeamais were released in 20g of disinfested sorghum grains treated with ethanolic extracts of the botanicals in plastic bottles at different concentrations of 2.5, 5.0 and 10.0x104ppm at 30°C and 70% RH. Adult mortalities and lethal concentrations that killed 50% (LC50) of the weevils’ population at 24 Hours After Treatment (HAT) were determined. Concentration of body protein as well as inhibition rate of Acetylcholinesterase (AChE) activity in S. zeamais exposed to sorghum treated with the botanical extracts were also investigated. Results showed that the adult mortality ranged from 82.50 ± 2.50 to 100.00 ± 0.00% within 3 Days After Treatment (DAT). L. inermis had the highest LC50 value (1.72 x 104 ppm), while E. balsamifera had the lowest (1.12 x 104 ppm). Biochemical tests showed that the botanicals reduced body protein and inhibited the activity of Acetylcholinesterase (AChE) in S. zeamais. The botanicals were found to be toxic to adult S. zeamais and therefore could be utilized to reduce the weevils’ infestations in sorghum grains. Synthetic insecticides have been commonly used for controlling pests in stored products [1-4]. However, this has resulted in problems such as pest resurgence and increase in costs of application arising from the development of resistance to insecticides [5,6]. This has led to the search of alternative, eco-friendly methods of controlling insect pests of storage such as the use of botanicals [7,8]. In this regard the toxicity of many plant materials has been evaluated against S. zeamais in stored grains with recorded success [7,9-12]. One of the ways used to evaluate the toxicity of insecticides is by measuring their mortality effects on insects. Ethanolic, methanolic and acetonic extracts of various plant materials have been reported to cause high mortality of S. zeamais [9,12-14]. It was reported that some medicinal plants such as olax subscorpioidea Oliver (Santalales: Olacaceae), aframomum melegueta k. schum (Zingiberales: Zingiberaceae) and zingiber officinale Rosce (Zingiberales: Zingiberaceae) caused adult mortality of S. zeamais which ranged from 18.35 to 88.35% after 72 hours of exposure . Tilahun and Daniel reported the toxicity effects of seed powder of Azadirachta indica a. Juss (Sapindales: Meliaceea) against S. zeamais and recorded 23.00 to 28.67% adult mortality after 45 days of treatment . Another way of assessing toxicity of insecticides is by evaluating their effects on biochemical parameters of insects . Kumar and Michael noted that the carbohydrates, proteins and lipids play an important role in the biochemical process underlying growth and development of insects . Fox et al., reported that the reproductive capacity of adult female insects is affected largely by their body protein content . Piri et al., noted that proteins are important for individual-level fitness-associated traits such as body size, growth rate and fecundity . At high levels of organization, proteins have been linked to population dynamics, life cycles and even biological diversification . Some of the biochemical composition of Acanthoscenlides obtectus Say, S. oryzae, S. granarius and T. confusum have been investigated [17-19,21,22]. However, little is known with regards to toxicity of botanicals against body protein of S. zeamais. In addition to body protein, enzymes such as Acetycholinesterase (AChE) play a vital role in insect survival. AChE is a key enzyme of the cholinergic system regulating the level of acetylcholine and terminates nerve impulses by catalyzing the hydrolysis of acetylcholine . Some botanicals were reported to inhibit AChE activity in some insect pests of storage such as S. oryzae, S. granarius and T. castaneum , but little is known on effects of botanicals in inhibiting AChE activity in S. zeamais [24-28]. This study was carried out to investigate the ability of E. balsamifera, L. inermis, M. hirtus and E. balsamifera, L. inermis, M. hirtus to cause adult mortality, reduce concentration of body protein and inhibit AChE activity in S. zeamais. One hundred adults of S. zeamais were obtained from infested sorghum grains at Katsina Central Market and then introduced into 500ml rearing bottles containing 250g of the disinfested sorghum grains. The bottles were covered with muslin cloth and secured with rubber bands. They were then kept in an incubator for oviposition at 30°C and 70% RH for seven days, after which the parents were removed. The bottles were maintained in the incubator under the same condition for adult emergence. Progeny of 7 days old were sieved and used for the laboratory experiments. Fresh leaves of E. balsamifera, L. inermis, M. hirtus and E. balsamifera, L. inermis, M. hirtus were shade-dried and ground into powder using a laboratory blender. One hundred grams of each plant powder was dissolved in 400ml of ethanol in conical flasks. Mouths of the conical flasks were properly corked and kept in a refrigerator for 48 hours. The extract was separated using muslin cloth and filtered with Whatman No.1 filter papers as described by Khaliq, et al., . The filtrate was separately concentrated by evaporating excess solvents using rotary evaporator with rotary speed of 3 to 6 rpm for 8 hours. The resulting extract was air-dried to remove traces of the solvent and stored in refrigerator at 4°C . The method of de Oliveira, et al., was adopted to assess adult mortality of S. zeamais in sorghum grains treated with ethanolic leaf extracts of the test plants . Crude extracts were diluted with ethanol to make different concentrations of 2.5, 5.0 and 10.0 x 104 ppm. Twenty grams of sorghum grains were weighed and put into 250 ml plastic bottles. The grains were impregnated with 2ml of the ethanolic extracts at three concentrations, while the control contained the grains. Ten weevils were released into each of the bottles after complete evaporation of the solvent. The grain mass was mixed thoroughly with the aid of glass rod and air-dried until complete solvent evaporation. All treatments were arranged in a Completely Randomized Design (CRD) in the incubator and replicated four times. The set-ups were inspected daily and dead weevils in each treatment were removed and recorded daily for three days. To evaluate LC50 of the ethanolic extracts of the botanicals against S. zeamais, methods of Ebadollahi and Mahboubi were employed . The number of dead weevils at the end of 24 hour exposure to the extracts was used to determine the LC50 of the botanicals by using probit analysis with SPSS (version 16.0) software package . Samples for protein assays were prepared following Askar, et al., . Adult weevils exposed to LC50 of ethanolic extracts of the botanicals for 7 days were freeze killed at - 20°C. A sample of 0.5g of the insects was taken from each bottle and homogenized in 10 times (5mL) volumes (w/v) of phosphate buffer (pH 7.2) using a glass homogenizer under ice. The total homogenates were centrifuged at 4000 rpm for 10min at 4°C using a centrifuge. The supernatant was transferred to new eppendof’s tubes and preserved at - 20°C for spectrophotometry. S. zeamais adults were fumigated with LC50 of ethanolic extracts of E. balsamifera, L. inermis, M. hirtus and E. balsamifera, L. inermis, M. hirtus as fumigant toxicity assay. After seven days of fumigation, the weevils were homogenized in phosphate buffer saline (50mM, pH 8) using a Teflon glass tissue homogenizer. The homogenate was centrifuged at 10,000 rpm for 20min at 4°C. The supernatant was filtered and used as the AChE preparation. Methods of Ellman, et al., and Chaubey were adopted for the assay and AChE activity was determined spectrophotometrically [28,35]. Absorbance in the treated samples was evaluated at 412nm for 6min and compared to that of the control. All measurements were made in triplicate [25,26,28]. Data generated were tested for normality using Shapiro-Wilk and Jacque-Bera normality tests [36-38]. Data from adult mortality tests were subjected to two-way ANOVA using Graph Pad Prism (version 7.03). Probit analysis was employed to calculate LC50 of the extracts with the significant differences determined by X2 goodness of fit using SPSS (version 16.0). One-way ANOVA was used to test if there were significant differences in the body protein and AChE activity inhibition in adults of S. zeamais exposed to LC50 of the extracts by using PAST (version 2.17). Significantly different means were separated by Bonferroni’s and Tukey’s multiple comparisons tests . All analyses were performed as statistically significant p<0.05. 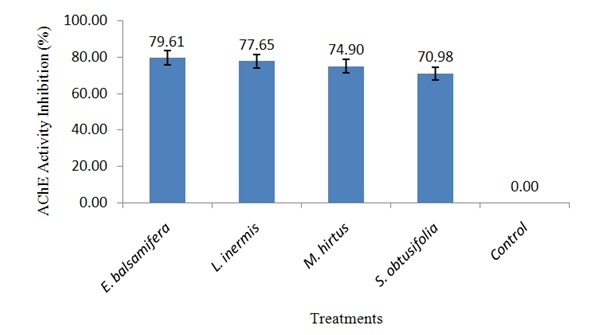 Ethanolic leaf extracts of the selected botanicals applied at different concentrations of 2.5, 5.0 and 10.0x104 ppm exhibited varying percentage mortalities of S. zeamais within 1, 2 and 3 days after treatment (Table 1). Analysis of variance indicated that the difference in adult mortalities of S. zeamais was highly significant among the botanicals (F (4, 45) = 2947.00, p<0.0001) as well as within the concentrations (F (2, 45) = 18.00, p<0.0001). Bonferroni’s multiple comparisons test revealed that at 2.5 x 104 ppm, E. balsamifera, L. inermis and M. hirtus caused statistically similar mortality which was higher than that in E. balsamifera, L. inermis, M. hirtus at 3 DAT. At 5.0 and 10.0 x 104 ppm, all the botanicals had the same effect on the weevils’ mortality within 3 DAT. Table 2 shows that L. inermis had the highest LC50 value as 1.72 x 104 ppm, while E. balsamifera had the lowest as 1.12 x 104 ppm at 24 HAT. The probit equations were y = 1.074x - 0.053, y = 1.065x - 0.251, y = 0.365x + 0.296 and y = 0.669x - 0.100 for E. balsamifera, L. inermis, M. hirtus and E. balsamifera, L. inermis, M. hirtus , respectively (Table 2). The slopes varied between 0.365 ± 0.723 and 1.074 ± 0.739. X2 goodness of fit (0.005 - 0.092) reveals that the LC50 of ethanolic extracts against the weevils was not significantly different (p>0.05) among concentrations of each of the botanicals. The protein in S. zeamais exposed to ethanolic extracts of the botanicals appeared to follow the order: E. balsamifera<E. balsamifera, L. inermis, M. hirtus < 0.0001) existed in protein content among the weevils exposed to sorghum grains treated with LC50 of ethanolic extracts of different test botanicals. Further, Tukey’s multiple comparisons test revealed that all treatments differed from each other with insects exposed to E. balsamifera having the least body protein content. The inhibition of AChE activity in S. zeamais by ethanolic extracts was 79.61, 77.65, 74.90 and 70.98 for E. balsamifera, L. inermis, M. hirtus and E. balsamifera, L. inermis, M. hirtus , while none was recorded in weevils exposed to the untreated grains (Figure 2). One-way ANOVA revealed that inhibition of the AChE activity was significantly different (F (4, 10) = 4190.00, p<0.0001) among the botanical treatments. Tukey’s pairwise comparisons showed that the inhibition activity was statistically similar in weevils exposed to E. balsamifera and L. inermis but higher than the rest. Ethanolic extracts of the selected botanicals were found to be highly effective by resulting in total mortality of adults of S. zeamais in sorghum grains at all concentrations of E. balsamifera and higher rates of L. inermis, M. hirtus and E. balsamifera, L. inermis, M. hirtus . The efficacy of the test botanicals is in line with earlier findings in which ethanolic extracts of some plant species caused adult mortality of maize weevils [10,13]. Ajayi reported that ethanolic extract of D. regia seeds applied at 2.0mg/g maize grains resulted in 12.50% adult mortality of S. zeamais after five days of exposure . Similarly, findings of Ibrahim, et al., showed that application of ethanolic leaf extract of C. odorata at 10ml / 50g maize caused 14.00% adult mortality of S. zeamais at 7 DAT . The observed increase in mortality of S. zeamais caused by ethanolic extracts with increase in post treatment period in this study agrees with previous findings [10,12,13]. Ethanolic leaf extracts of E. balsamifera, L. inermis, M. hirtus and E. balsamifera, L. inermis, M. hirtus were generally found toxic to adult S. zeamais and suppressed their survival in sorghum grains by causing considerably high mortality. All the selected botanicals were effective against the weevil even at lower concentrations. This was possible because plant species contain secondary metabolites which are vast storehouse of compounds such as the steroids, phenolic compounds and tannins with wide range of biological activity reported to have great impact on insecticidal activities [39,40]. Other bioactive compounds such as terpenoids, flavonoids, alkaloids, saponins and glycosides were found in the leaf extracts of E. balsamifera, L. inermis and E. balsamifera, L. inermis, M. hirtus by others and reported to be pesticidal in nature [40-42]. Ileke, et al., reported the presence of alkaloids, flavonoids, saponins and tannins, in the powders and methanolic extracts of M. fragrans and A. melegueta and concluded their insecticidal activity against S. zeamais . The characteristic smell of the study botanicals might have also contributed to their insecticidal activity by repelling the insects away from the grains as suggested by Ileke, et al., . The present study investigated LC50 of E. balsamifera, L. inermis, M. hirtus and E. balsamifera, L. inermis, M. hirtus against S. zeamais in sorghum grains due to lack of information on this aspect in previous studies. However, lethal concentrations of other botanicals used to control insect pests of storage were determined [43-45]. LC50 of the plants showed that the ethanolic extracts had great efficiency by causing 50% adult mortality of S. zeamais in sorghum even at a concentration below the lowest amount applied within 24 HAE. E. balsamifera was more effective than the other botanicals followed by M. hirtus. The effectiveness the selected botanicals in killing adult weevils at lower concentration within short period is in conformity with Biswas, et al., who reported high efficiency of L. inermis against T. castaneum . Low LC50 values of ethanolic extracts of the test botanicals concur with Rani and Devanand, who reported that among methanolic extracts of the plants tested Momordica charantia L . was the most effective with LC50 of 2.82mg / 20g maize grains against S. zeamais. There was a decrease in body protein of the maize weevils exposed to lethal concentrations of all the botanicals compared to the control. The reduction in body protein agrees with Askar, et al., who reported that both clove oil and diatomaceous earth reduced body protein of S. zeamais and S. oryzae from 0.10mg/ml in the control to 0.09 and 0.06mg/ ml, respectively . It was earlier reported by Piri, et al., that sub-lethal concentrations of spinosad resulted in a significant decrease in protein content of bombyx mori Walker . This decrease in body protein could be attributed to low feeding efficiency of the insects due to antifeedant effect of many other insecticides and hence a decrease in protein concentration [40,46]. Another reason might be as a result of protein break down into amino acids which help in energy supply to the insect . It was found that application of E. balsamifera, L. inermis, M. hirtus and E. balsamifera, L. inermis, M. hirtus in the form of powders and extracts significantly affected body protein of S. zeamais which could probably affect the aforementioned biological aspects of the weevil. The reduction in concentration of the body protein might have contributed to decline in the insect’s population and hence decreased infestations in the sorghum grains. This could also be attributed to decrease in vitellogenin, a precursor yolk component, present of in the body protein of vitellogenic females, which its amount reflects the insect reproductive performance . AChE is a hydrolytic enzyme in insect body that influences the nervous system . In the present study the LC50 of ethanolic extracts of E. balsamifera, L. inermis, M. hirtus and E. balsamifera, L. inermis, M. hirtus significantly inhibited the activity of AChE in S. zeamais agreeing with Li, et al., who reported that methyl alcohol, ethyl acetate and petroleum ether fruit extracts of Illicium verum hook. F . inhibited the activity of AChE in S. zeamais. Similarly, the LC50 of essential oils of Pimpinella anisum and Ocimum basilicum have demonstrated their interference with AChE activity in S. granarius . Recently, methanolic extract of Urginea maritime at a concentration of 1000µg/ml was found to result in 73.37% inhibition of the activity of AChE in S. oryzae . Also, another finding has confirmed the inhibitory effect of botanicals on the activity of AChE where Chaubey reported that LC50 of Cuminum cyminum essential oil reduced AChE activity in S. zeamais to 66.90% compared to 31.59% of the control . The inhibitory effect on AChE activity in S. zeamais exposed to lethal concentrations of all the botanicals has shown their possible potentiality as biopesticides. This is because it has been reported that inhibition of AChE in cholinergic synapses of the nervous system is the primary mechanism of acute toxicity of insecticides . Therefore, the botanicals probably have neurotoxic effects on S. zeamais by interfering with the passage of impulses in the insect nervous system leading to inability of AChE to hydrolyze acetylcholine which builds up in the synapse and results in excessive neuro excitation . The mortality effects of E. balsamifera, L. inermis, M. hirtus and E. balsamifera, L. inermis, M. hirtus against S. zeamais recorded in this study may also be attributed to their ability to inhibit the activity of AChE as suggested by Rajashekar, et al., . Thus, the neurotransmitting system of the weevils represents a target for insect control. It was found that application of ethanolic extracts of the selected botanicals resulted in high adult mortality of S. zeamais even at the lower concentration of 2.5 x 104 ppm after three days of treatment with E. balsamifera as the most effective followed by L. inermis and therefore could be used to reduce S. zeamais infestations in sorghum grains. The LC50 of the botanicals were found to be either lower than or within the range of recommended dose/concentration (1-5%) of botanicals in stored commodity. Findings of this study have revealed that application of E. balsamifera, L. inermis, M. hirtus and E. balsamifera, L. inermis, M. hirtus at the lowest concentration of 2.5 x 104ppm could cause the death of 50% S. zeamais within one to three days. Lethal concentrations of all the botanicals reduced body protein of S. zeamais and have the ability to interfere with neurotransmitting system of the weevil by inhibiting the activity of AChE. The toxicity of the test botanicals against adult S. zeamais infers that they could be utilized to reduce the weevils’ infestations in stored sorghum. However, further investigations on their toxicity on mammals and other insect pests are hereby recommended. Nguemtchouin MGM, Ngassoum MB, Chalier P, Kamga R, Ngamo LST, et al. (2013) Ocimum gratissimum eseential oil and modified montmorillonite clay, a means of controlling insect pests of stored products. J Stored Prod Res 52: 57-62. Baributsa D, Baoua IB, Bakoye ON, Amadou L, Murdock LL (2017) PICS bags safely store unshelled and shelled groundnuts in Niger. J Stored Prod Res 72: 54-58. Nayak MK, Daglish GJ (2017) Base-line susceptibility of field populations of Rhyzopertha dominica (F.) to spinosad in Australia. J Stored Prod Res 70: 1-6. Paudyal S, Opit GP, Osekre EA, Arthur FH, Bingham GV, et al. (2017) Field evaluation of the long-lasting treated storage bag, deltamethrin incorporated, (ZeroFly® Storage Bag) as a barrier to insect pest infestation. J Stored Prod Res 70: 44-52. Liu ZL, Zhao NN, Liu CM, Zhou L, Du SS (2012) Identification of insecticidal constituents of the essential oil of Curcuma wenyujin rhizomes active against Liposcelis bostrychophila badonnel. Molecules 17: 12049-12060. Cosmas P, John CT, Agathar K, Ronald M, Kufa M, et al. (2018) Use of botanical pesticides in controlling sitophilus zeamais (Maize Weevil) on stored Zea mays (Maize) grain. Modern Concepts and Developments in Agronomy 1: 1-4. Suleiman M (2014) Efficacy of some spices as sorghum grain protectants against sitophilus zeamais Motschulsky [Coleoptera: Curculionidae]. African Journal of Agricultural Research 9: 841-845. Suleiman M, Rugumamu CP (2017) Management of insect pests of stored sorghum using botanicals in Nigerian traditional stores. Journal of Stored Products and Postharvest Research 8: 93-102. Adedire CO, Akinkurolere RO, Obembe OM (2012). Efficacy of cashew kernel extracts in the control of the maize weevil, sitophilus zeamais (Coleoptera: Curculionidae). Archives of Phytopathology and Plant Protection 45: 831-839. Ajayi OE (2013) Insecticidal activity of powder and extracts of Delonix regia seed against maize weevil, sitophilus zeamais (Coleoptera: Curculionidae). FUTA Journal of Research in Sciences 1: 54-62. Wini GJ, Nukenine EC, Ndjonka D, Suh C, Adler C, et al. (2015) Efficacy of diatomaceous earth and wood ash for the control of sitophilus zeamais in stored maize. Journal of Entomology and Zoology Studies 3: 390-397. Suleiman M, Rugumamu CP, Ibrahim ND (2018) Insecticidal toxicity of some botanicals against sitophilus zeamais Motsch. (Coleoptera: Curculionidae) in stored sorghum grains in Nigeria. Journal of Entomology and Zoology Studies 6: 1280-1287. Ibrahim YJ, Abugri AD, Afun JVK (2016) Efficacy of ethanolic leaf extract of Chromolaena odurata in controlling sitophilus zeamais in stored maize. Journal of Experimental Agriculture International 14: 1-10. Ileke KD, Adesina JM, Obajulaye EO (2016) Synergic effects of two botanical entomocides as pest-protectants in maize grains. Journal of Biological Research 89: 34-39. Oni MO, Ogungbite OC (2015) Entomotoxicant potential of powders and oil extracts of three medicinal plants in the control of sitophilus zeamais infesting stored maize. Journal of Plant and Pest Science 2: 8-17. Tilahun FE, Daniel DH (2016) Effect of neem leaf and seed powders against adult maize weevil (sitophilus zeamais Motschulsky) mortality. International Journal of Agricultural Research 11: 90-94. Askar SI, Al-Assaal MS, Nassar AMK (2016) Efficiency of some essential oils and insecticides in the control of some Sitophilus insects (Coleoptera: Curculionidae). Egyp J Plant Pro Res 4: 39-55. 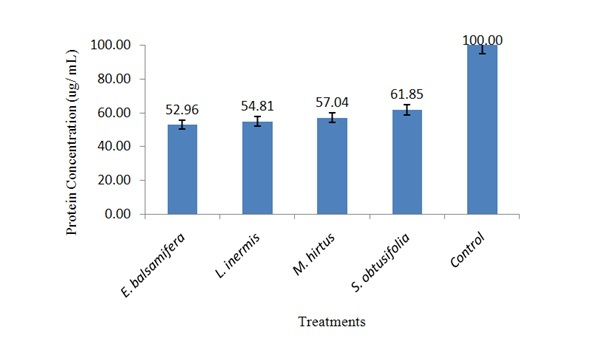 Kumar MDA, Michael AS (2012) Changes in the activities of proteins and carbohydrates in haemolymph of silkworm, bombyx mori treated with greenleaf. International Journal of Environmental Sciences 3: 119-125. Fox CW, Stillwell RC, Wallin WG, Hitchcock LJ (2006) Temperature and host species affect nuptial gift size in a seed-feeding beetle. Funct Ecol 20: 1003-1011. Piri F, Sahragard A, Ghadamyari M (2014) Sublethal Effects of Spinosad on Some Biochemical and Biological Parameters of bombyx mori Walker (Lepidoptera: Pyralidae). Plant Protect Sci 50: 135-144. Ali NS, Ali SS, Shakoori A (2011) Effects of sublethal doses of talstar on biochemical components of melathion-resistant and -susceptible adults of Rhyzopertha dominica. Pakistan J Zool 43: 879-887. Lingampally V, Solanki VR, Kaur A, Raja SS (2013) Effect of andrographolide on the protein content of Tribolium Confusum (Duval). International Journal of Pure and Applied Zoology 1: 70-79. Praveena A, Sanjayan KP (2011) Inhibition of acetylcholinesterase in three insects of economic importance by linalool, a monoterpene phytochemical. Insect Pest Management, A Current Scenario 340-345. Rajashekar Y, Raghavendra A, Bakthavatsalam N (2014) Acetylcholinesterase inhibition by biofumigant (Coumaran) from leaves of Lantana camara in stored grain and household insect pests. Biomed Res Int 2014: 1-6. Abo El Makarem H, El Kholy SE, Abdel-Latif A, Seif AI (2015) Physiological and biochemical effects of some essential oils on the granary weevil, sitophilus granartius (L.) (Coleoptera: Curculionidae). Egypt J Exp Biol (Zoo.) 11: 117-123. Maazoun AM, Hlel TB, Hamdi SH, Belhadj F, Jemâa JMB, et al. (2017) Screening for insecticidal potential and acetylcholinesterase activity inhibition of urginea maritima bulbs extract for the control of Sitophilus oryzae (L.). J Asia-Pac Entomol 20: 752-760. Li J, Guo Q, Han S, Jiang L, Liang G (2013) Types, morphologies and dis­tribution of antennal sensilla of Quadrastichus erythrinae. Fla Entomol 96: 1288-1297. Chaubey MK (2017) Evaluation of insecticidal properties of Cuminum cyminum and Piper nigrum essential oils against sitophilus zeamais. Journal of Entomology 14:148-154. Khaliq A, Nawas A, Ahmad MH, Sagheer M (2014) Assessment of insecticidal potential of medicinal plant extracts for control of maize weevil, sitophilus zeamais Motschulsky (Coleoptera: Curculionidae). Basic Research Journal of Agricultural Science and Review 3: 100-104. Abou-Elnaga, Zeinab Sh (2015) Efficacy of extracts of some Egyptian plants against economically important stored grains pest Sitophilus oryzae L. Journal of Entomology and Zoology Studies 3: 87-91.
de Oliveira TA, Ronche-Teles B, da Fonseca CRV, da Silva SLR, Santos PA, et al. (2012) Insecticidal activity of Vitex cymosa (Lamiaceae) and Eschwelera pedicellata (Lecythidaceae) extracts against sitophilus zeamais adults (Curculionidae). Emir J Food Agr 24: 49-56. Ebadollahi A, Mahboubi M (2011) Insecticidal activity of the essential oil isolated from Azilia eryngioides (PAU) hedge et lamond against beetle pests. Chil J Agr Res 71: 406-411. SAS Institute (1999) SAS/STAT User’s Guide, Version 8, Volume 2. SAS Institute, North Carolina, USA. Lowry OH, Passonneau JV, Rock MK (1961). The stability of pyridine nucleotides. J Biol Chem 236: 2756-2759. Ellman GL, Courtney KD, Andres V Jr., Featherstone RM (1961) A new and rapid colorimetric determination of acetylcholinesterase activity. Biochem Pharmacol 7: 88-95. Sokal RR, Rohlf FJ (1995) Biometry (3rdedn): A Series of books in biology. WH Freeman and Company, New York, USA, Pg no: 887. Jolicoeur P (1999) Introduction to Biometry (1stedn). Springer+Business Media LLC, New York, USA, Pg no: 516. Le CT (2003) Introductory Biostatistics. John Wiley & Sons Inc., New Jersey, USA, Pg no: 553. Biswas KK, Sharmin N, Rabbi MA (2016) Evaluation of the insecticidal activity of Lawsonia inermis Linn. against the red flour beetle, Tribolium castaneum (Herbst). Natural Products 12: 8-11. Hikal WM, Baeshen RS, Said-Al Ahl HAH (2017) Botanical insecticides as simple extractives for pest control. Cogent Biology 3: 1-16. Doughary JH, El-mahmood AM, Tyoyina I (2008) Antimicrobial activity of leaf extracts of Senna obtusifolia (L.). Afr J Pharm Pharmaco 2: 007-013. Wagini NH, Soliman AS, Abbas MS, Hanafy YA, Badawy EM (2014) Phytochemical analysis of Nigerian and Egyptian henna (Lawsonia inermis L.) leaves using TLC, FTIR and GCMS. Plant 2: 27-32. Rani PU, Devanand P (2011) Efficiency of different plant foliar extracts on grain protection and seed germination in maize. Research Journal of Seed Science 4: 1-14. Naeem M, Anjum SI, Ismail M, Khan J, Bibi S, et al. (2015) Laboratory assessment of different botanical extracts and cypermethrin against insect pests. Journal of Entomology and Zoology Studies 3: 84-88. Coleoptera: Curculionidae). Journal of Entomology and Zoology Studies 5: 324-335. Etebari K, Mirhoseini SZ, Matindoost L (2005) A study on interaspecific diversity of eight groups of silkworm (bombyx mori) by biochemical markers. Insect Sci 12: 87-94. Nath BS, Suresh A, Varma BM, Kumar RP (1997) Changes in protein metabolism in hemolymph and fat body of the silkworm, bombyx mori (Lepidoptera: Bombycidae) in response to organophosphorus insecticides toxicity. Ecotoxicol Environ Saf 36: 169-173. Rugumamu CP (2006) Varietal role in the management of the larger grain borer, Prostephanus truncatus (horn) in stored maize. Tanzania Journal of Science 32: 13-22. Figure 1: Concentration of body protein in S. zeamais exposed to LC50 of ethanolic leaf extracts. Figure 2: AChE activity inhibition in S. zeamais exposed to LC50 of ethanolic leaf extracts. Table 1: Mortality of adult S. zeamais exposed to 2.5, 5.0 and 10.0 x 104 ppm of ethanolic botanical extracts in three days after treatment. Table 2: LC50 of ethanolic leaf extracts against adult S. zeamais at 24 HAT. HAT = Hours After Treatment; CI = Confidence Interval; X2 = Chi-square. Citation: Suleiman M, Sani I (2018) Insecticidal Activity of Ethanolic Leaf Extracts against the Maize Weevil, Sitophilus Zeamais Motsch. (Coleoptera: Curculionidae). Archiv Zool Stud 1: 004. Copyright: © 2018 Suleiman M and Sani I. This is an open-access article distributed under the terms of the Creative Commons Attribution License, which permits unrestricted use, distribution, and reproduction in any medium, provided the original author and source are credited.